Looking to get more out of your kitchen? No problem: this GROHE kitchen tap will upgrade your kitchen with its attractive minimalistic design and a combination of super convenient features. It comes with a high spout that swivels in a 360° range to maximize your operating radius, which is great when working with two basins or filling several pots in succession. The pull-down shower head will reach all corners of your basin without difficulty. To rinse dishes or wash fruit, you can switch between a fine spray jet and a powerful shower jet as appropriate. 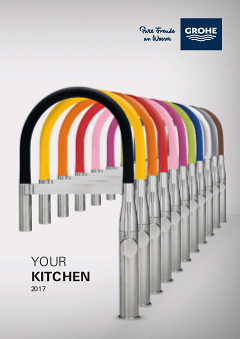 Finished with the lustrous GROHE StarLight chrome coating, this tap is an all-round attractive choice for your kitchen.